The Danube Delta is Unique in the Europe. With its diverse fauna and geographic position Danube Delta is an amazing place to visit. Iron Gate natural park is a protected area established by Law no. 5 / 2000 on approving the National Spatial Plan Section III of protected areas. Iron Gates Natural Park is located in the south-west of Romania, at the state border with Serbia and Montenegro, occupying an area of 115,655 ha. In the west stretches between 21 21 'and 22 36' eastern longitude and in latitude between 44 51 'and 44 28' 30''north latitude. The Government Decision no. 230 in 2003 to establish the exact limits of the Iron Gates Natural Park. On the territory of the park was established 18 nature reserves. Southern boundary of the park is the river Danube that creates here the longest and one of the most spectacular narrow paths in Europe. The park was created to protect and conserve existing biodiversity and landscape elements. Concentration across the Iron Gates Natural Park of the entire geological structure of South Carpathians creates an extraordinary diversity of relief and landscapes. Iron Gates Natural Park is a geological atlas even outdoors, with a series of geological and paleontological points of interest nationally renowned. The complexity of geological structure and tectonics led to the formation of a varied relief from depression, gentle hills, the massive mountains and slopes. On the left side of the Danube rises Locvei Mountains Mountains Almaj, Mehedinti Mehedinti Mountains and Plateau. Maximum altitude in the park is 968m (Peak Santa linden tree) Almaj Mountains. Danube forms here the longest and most spectacular gorge in Europe, with a length of 134 km. Romanian Danube Gorge presents the narrow sectors and areas of expansion. The most interesting part of the canyon is Cazane area where karst topography is well represented. The Iron Gates Natural Park can be found all types of karst terrain. Endocarstul is well represented through the caves and potholes (Ponicove cave, cave with water, fits hole cave, Cave of Outlaws, etc..). Phenomena exocarstice: keys, sinkholes, uvala, lapiezuri are also well represented, particularly in karst plateau and the hills of Saint Helena Ciucarul Great and Small Ciucarul be found in Berzasca Valley, Valley Mudoviţa Seac�f, etc. ..
Iron Gate area climate is temperate continental with Mediterranean influence significant. Influence of hot air home sub mediterraneean give higher values of temperature compared with the rest of the country, the annual average of about 11 ˨ C.
The Iron Gates Natural Park region manifests winds with local and specific canyon breezes created due to temperature differences between warm water and strong Limestone slopes. Average annual rainfalls ranging between 800-1000 mm. Danube is the main stream of the Iron Gates Natural Park area. It receives tributaries that have their source in Semenic, Locvei, Almaj, Mehedinti and Cerna, of which the most important are: Nera Radimna, Moldova, Mraconia, Cerna and Bahna. 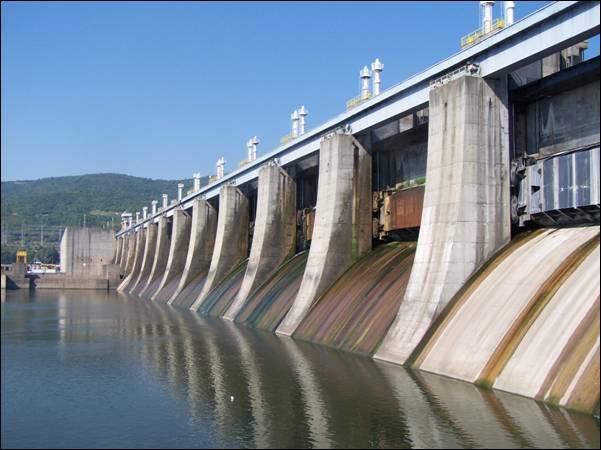 Due to the construction of Iron Gates I Dam water level has greatly increased thus leading to flooding of large areas of land and the emergence of new aquatic habitats, thus leading to an expansion of wetlands. Lake resulting from dam removal is the most fitting hydrotechnics the whole length of the Danube. The lake has a length of 130 km and an area of 700 km, and an average water volume of 12 km. Danube-Black Sea Canal is a waterway in the county of Constanta, Romania, connecting the ports of Constanta and Cernavoda on the Danube south of the Black Sea port of Constanta to shorten the road to approximately 400km. The channel is part of the important European waterway between the Black Sea and North Sea (the Rhine-Main-Danube Canal). Plans to build this channel existed since the nineteenth century. Since the annexation of Dobrudja to Romania in 1878, began to be circulated the idea of a fourth arm of the Danube, this time artificially to shorten the road to the Black Sea. The technical conditions of the time were that such performance is extremely difficult and costly, so the King Carol I, realistically, refused to get involved in this project. Later, Charles II and he courted the idea of the channel, but the global economic crisis and then the beginning of the Second World War made the realization to be postponed sine die. Canal construction began in 1949, many workers are political prisoners in prison. Work was suspended in 1955 and resumed only in 1975. The canal was inaugurated Saturday, May 26, 1984 by Nicolae Ceaužescu. Were excavated about 300 million m3 (25 million more than the Suez Canal and 140 million more than the Panama Canal) and were 3.6 million m3 of concrete poured. With a length of 64 km, a depth of 7 m, a width of 70 m and based on the area of 110-140 m, the channel has a maximum capacity to transport 75 million tonnes of cargo. Maximum draft allowed is 5.5 m allowing ships access to the river and small sea. At each end there are two locks that allow traffic in both directions. Channel crossing places Cernavoda Saligny, Mircea Voda, Satu Nou, Medgidia, Castelu, White Gate. This channel fork. Northern Branch (White Poarta Midia Navodari) through Nazarcea, Constanta, Ovidiu and Navodari. Branch south through Bessarabia and Agigea. Building the canal required an investment of about $ 2 billion. Initial estimates provided for the recovery of investment in 50 years. Channel operation without annual income but about 3 million euros, implying a payback period of more than 600 years. Enthusiasts of exotic lands, the beautiful landscape should not go too far for a trip to their liking. Danube Delta, the largest wetlands reserve in Europe, it presents a fauna and flora an extremely varied, and some great pictures of whatever you can all find in our country. 300 species of birds, among which unique colonies of pelicans Worth mentioning, many aquatic species, narrow channels, on which we sail boat infiltrating leafy trees ... However ubiquitous Delta. I promised that I would talk about Delta. This area protected by several national and international bodies. A reservation is unique in Europe and spread over an area of over 2500 kilometers square. Total area increased annually due to silt deposited. It is included in UNESCO heritage 19 years, as part of the earth's biosphere. This land has over 1,200 species of trees and plants, the richest ornithological fauna of Europe (300 species), among which unique colonies of pelicans, and the rich fauna ichthyological fauna (100 species). Danube Delta there are about 20,000 people, most of the fishermen. In recent years, the dry landscape has changed a lot, grabbing hostels and hotels everywhere. As you can see and the photos, there are much reed, bulrush, sedge, willow, lilies. Specifically, 78% of the Danube delta area is covered by these types of plants. Mr. Stamate, our host, told us about "plaur", which I did not know. It is a mixture of reeds and roots of aquatic plants which move as a real floating islands. And you can go through each day, that at some point to see that you can not reach the other side, because the road is blocked by floating. - The existence of aquatic fauna in the Danube Delta is 98% of its total from all over Europe! - Birds living in the Danube Delta is 81% of all birds in Romania! - Aquatic birds living in the Danube Delta is 82% of all aquatic birds in Europe! - Animal species in forest Letea represent over 70% of animal species in the Danube Delta Biosphere Reserve! We have not been able to visit and beam Letea forest, because it was very far from where we stayed, but I know that is the northernmost subtropical forests of Europe. Letea forest are found in 500 species of plants and over 3,000 animal species, including more than 2,000 are insects. Several hundred wild horses live in the forest and the meadows Letea its surroundings. In 1930, some Letea forest was put under protection, and in 1938 became a nature reserve. In 1980, Forest Letea was declared a Biosphere Reserve, while ten years later was included as a strictly protected area in DDBR. "In rivers that have known and which are navigable when you come to Istria and is great ..." note in Herodotus of Halicarnas Histories (484-425 BC), the oldest description of the lands of the Lower Danube , Publius Ovidius Naso (about 10-15d. BC) and he remarked that "... the Danube and higher / Below are the Nile, he does not want any." The second river in Europe and 26 th in the world, with almost 2900km in length, over 800 000km2dimensiunea basin inhabited by about 80 000 000 inhabitants in eight countries - this would be the visit card of the generous channel of water and that meet the rigid millennium role "high road" known and appreciated "beat" the launch Phoenicians, Greek trireme, hulks Roman Ships and caravels Byzantine, Genoese, Venetian boats, Turkish boats. "Istros in language and mythology Argonauts on the banks Nilului," Phisos "the Phoenicians" Danare "-" Donaris at Thracian-Getae, "Istrus" - "Histr -" Danubius "for the Romans," Rio Divino " at the court of Charles Quint and "Le roi des fluves of Europe in Napoleon Bonaparte's opinion, crosses the Danube in Romania last 1075km ending your way through the Delta - the most representative on the old continent and one of the most complex in the world. "Entered the lands of our country through a monumental triumphal arch through Deflieul Cazane, Danube left by a huge, incredible, wonderful fan of the Delta" (Geo Bogza). It is an original, unique or: the youngest land in Europe, neighboring some of the old mountains of the planet (Macin, hercinic massive, about 400 million years) - petec water and earth in eternal battle, always Moreover, cobweb of channels, sand banks, backwater, looking tropical forests, river-marine dunes in a vast, permanent metamorphosis. No wonder therefore that the information of historical differ: Herodotus believed that the Danube is divided in 5 to shedding branches, supported by Eratostene Story of Alexandria and greek Polybiu (272-120 I. Hr.) Contradicted the beginning of the millennium Our era of Pont Strabon geographer who has 7 branches, the Roman Pliny the Old convinced they were 6, the Egyptian Claudius Ptolemy (d. cca90-168 BC) returned to the arms 7 of the Danube flowing in the sea, including "Shut up Saint "Maps Middle Ages are not they more consistent, the Danube flows in Marmara ba, ba in the Dardanelles, and if you add and still waters in the Black Sea is an arm draws two-or a 5-6, one lost through the port of Constanta ... Only in 1856 the captain Engley Spratt draws a map closer to reality, that is to contemporaneity, because today things are already different lighthouses installed at Seaside in 1802 (Sulina) and 1865 (St. George) is now at 2 -- 3km return land. Delta population has a way of life unchanged for centuries. Implantation allowed discrete survival of the amazing ecosystems in the Delta. Tension than water to explain the small number of people (around 22,000 inhabitants), although natural increase is well above the average country (7-80/00). Territorial mobility of known travel and travel for temporary work, study, etc..
Delta's population is grouped in 15 rural villages and 2 cities: Tulcea and Sulina. Tulcea: gate entrance Delta town with a little under 100 000 inhabitants, built on the site of the Geto-Dacian settlement Aegyssus, dated 2600 years ago, said the current name in 1595 on map of Paolo Giorgi. It is a city based naval, industrial and tourism. Sulina: the easternmost city of the country, situated at the mouth of Sulina arm, the Romanian city with the lowest elevation (3.5 m), port of entry of vessels shipping on the Danube. You can choose to stay at one of the hostels scattered along the Danube channel or villages in the area, and for those demanding there are 4-star hotels, which supplements you are putting relaxation methods available pools and other facilities. What you do in a trip to Delta? Well, first and first to admire. For the first time in Delta, you will be impressed by the beauty and diversity of landscapes. From umbruoase channels, the sunny water lilies, from egrets to the pelicans, all you will enjoy looking. Second, fishing is a way of life here. Besides being and fish main course, from breakfast to late dinner. So take your fishing rod and fished as you eat your next meal. The fish is in abundance, and even the most inexperienced fishermen will definitely catch something. When you get tired of fishing, you can make even a water bath in the delta. It is crystal clear, but during the summer months is very hot, and will be a new experience. Do not forget your camera at home, otherwise you will regret that could not immortalize the beauty here.